An exotic 7/4 composition. Billy Drummond drum transcription and practice exercises available. The composer himself demonstrating Dubai by playing along with the recording. Our audio excerpt starts with the four-measure bass line introduction that starts the track. The hypnotic bass line loosely divides the opening 7/4 time signature into a three-beat/four-beat pulse. After eight measures of melody, there's an eight-measure B section in 6/4 for six measures before the return to the opening 7/4 bass line. The piano-less recording gives the horns a lot of freedom to just play what they hear, stimulated by Billy's own hypnotic and challenging drum accompaniment grooves. Dubai is named for the Persian Gulf city located in the United Arab Emirates. Billy performed there during the city's Second Annual Montreux Jazz Festival. In the liner notes to the CD Billy says: "I thought the title fit well with the vibe of this tune." 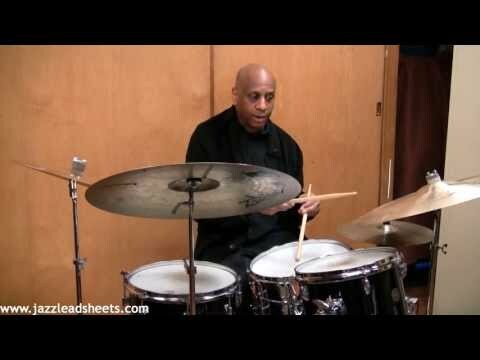 Drum Transcription: An eight-page in-depth drum transcription of everything Billy Drummond plays on his composition Dubai drum. Groove Examples and Practice Exercises: Playing in 7/4 can be tricky, so we've developed some practice exercises to help build fluidity and dexterity. Also included are some groove examples that Billy Drummond plays throughout the song. Drummers are composers too! If you're looking to improve your playing in odd meters, look no further. This 7/4 tune by Billy Drummond features some incredible odd-meter phrasing and soloing over Peter Washington’s sturdy bass work. Note how clearly Billy develops his ideas, and how musically and dynamically he develops his solo. Check out the videos above to see Billy talking about and playing his own composition at the jazzleadsheets.com studio.